Angel's Hope is a not-for-profit committed to enriching the lives of children fighting cancer by offering various outreach programs within the pediatric cancer community. We want to further Angel's dream of bringing hope and smiles to children affected by childhood cancer. 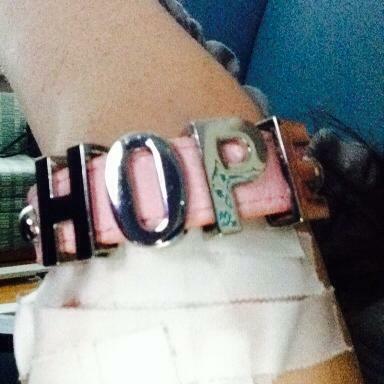 Angel received this bracelet shortly after she was diagnosed. She never took it off. I hope for a lot of things. I hope to start college in the fall. I hope to start working again very soon. I hope to be an amazing big sister. I hope that this chemo kills my cancer and I live a long, happy life. I hope that a cure is found so lives are no longer ended before they really begin. I want all of these things to happen and I think they could happen, so does that mean they're going to? Is it really that simple? I don't think so, but it doesn't stop me from hoping. That hope is what makes me still want to fight, even when I have bad days or days when I want to give up. That hope won't let me. That hope is what pushes me out the door to still do the stuff I like even if all I really want to do is throw the covers over my head and stay in bed all day. That hope won't let me." Angel's surprise Sweet 16 party at Children's of Alabama. Throughout her fight, Angel never lost her will to live, and she never lost her desire to help other children and families who were fighting their own battle. Using the name "Angel's Little Rays of Sunshine," she collected various items to donate to the hematology/oncology floor (otherwise known as 8QB) at Children's Hospital in Birmingham. She donated food for the food pantry, toiletry bags for parents and gift cards and toys for the kids. Then, she started thinking bigger. While fighting her own cancer battle, Angel missed many of those milestones that a teenager only gets once. She was in the hospital for her Sweet 16, Halloween (her favorite holiday), several other holidays and she almost missed prom. But several of her friends stepped up and made sure she was still able to enjoy those special moments, despite her circumstances. They had a surprise Sweet 16 party at the hospital and they threw her a surprise prom. She often said it was those memories that helped get her through the more challenging times. For those few hours, she was able to just be a "normal kid." Then she thought how great it would be if children fighting cancer had their own special memories to help them push through those tough times. The wheels started turning and next thing you know, Angel was planning a "carnival" for all children and families who were fighting. The event, which was held in August 2015, was a huge success so Angel started planning another event for 2016. She said it was her way of offering hope to other children and teenagers fighting. What better way to bring smiles than a party? ?